The Cocopah Indian Reservation is located in low lying desert approximately 13 miles south of Yuma and bounded by the Colorado River. Just five miles north of San Luis, it is situated 180 miles east of San Diego and 180 miles west of Phoenix. As the Community is divided into three parcels, the tribe’s 816 members reside in either East Cocopah, West Cocopah, or North Cocopah. The first Europeans to visit the Cocopahs in the sixteenth century received gifts of garden foods. The Cocopah, a generous, unmaterialistic people, had trouble adjusting to the ways of the Spaniards, Anglos, and Mexicans, who took over their homeland. As river people, the Cocopah traveled the waterways on tule rafts, poling them down to the mouth of the Colorado River to collect wild wheat. The Cocopah walked known trails to the north into what is now California, east along the Gila River, or into the Sierra de Juarez. After spring planting, some Cocopah families would travel to the high country to visit their PaiPai or Kumeyaay friends and relatives, sometimes not returning until harvest time. Later, they traveled by horseback, and today, many adult Cocopahs travel this course by automobile. Like other desert communities, the Cocopah Tribe looks to agriculture as a major economic resource. The Community, which leases its farmland to non-Indian farmers, keeps about 2,400 acres of land under irrigation. 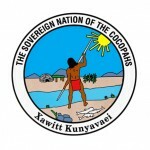 The Cocopah Indian Reservation was established by Executive Order No. 2711 in 1917. With the acquisition in 1985 of an additional 4,200 acres of land, the Cocopah started several new businesses including a convenience store, gas station, and smoke shop. The Cocopah Tribe opened a tribal museum and tribal cultural center in October 1996. The Community’s traditional tribal dance grounds are used for tribal social events such as dances, hand games, and annual festivities. Nearby attractions include the California dunes and Yuma historic district. Golf courses and night sports add to the entertainment mix. Visitors can also shop at San Luis, a port-of-entry community, and weather permitting, take in water sports such as fishing, skiing, and swimming at lakes along the Colorado River. The Cocopah Tribe operates the Cocopah Casino on Hwy 95 on the East Cocopah Reservation. The casino has 475 slot machines and Bingo.